In a couple of weeks from now (Sept.28th) I'll be releasing the second Florence Vaine novel A Vision of Green, so today I'd like to share the cover and synopsis for the book. Chesterport, Flo has discovered new friends and a hidden world. magical things that might lie in its green depths. grow in ways she could never anticipate. Anyway, I thought I'd say a little bit about the writing of this book. To be honest I was far more apprehensive about creating a second Florence novel than I was for the second Tegan book. I think this is because Flo has a very specific way of seeing the world, her actions and thoughts are almost always shaped by her experiences with her father. She's the sort of character who's emotionally draining to write about, but very cathartic at the same time. She's also the product of my younger mind, and I was afraid I wouldn't be able to slip back into her head, bringing her to life again but making sure she's still the same character. I love all of my characters equally, but I do find it far easier to write from Tegan's point of view. And by the way, Tegan makes a brief cameo appearance in Chapter 7 of A Vision of Green, the books are set in the same story world, sort of like spin offs of each other. Also, with this appearance comes a small spoiler for Tegan's Magic, so be warned! I finished writing A Strange Fire back in August 2010, and probably began writing the novel some time in 2009, (it might even have been 2008) I can't remember exactly. This gap in writing meant I was wary of beginning a sequel. Anyway, I released book one in March this year and then some people started asking if there would be a second. I told them there would be, because the book ends on a cliffhanger of sorts, and I knew there was still more to be told about Flo, I just didn't know when exactly the inspiration would come to write about her. In truth, I was scared that it might not come at all. But then the miraculous happened and ideas for the second book started flooding into my head early this summer. I sat down and wrote about Flo and it was like reacquainting myself with an old friend I hadn't seen in a long time. The story line is all mapped out, and the book is almost finished, I just need a few more weeks to make sure I finish it well. I don't want to do it half-arsed, just so that I can release it quicker. Not to say that there are hordes of people waiting for it to come out, but I know there are a few and I'm writing it for those few;) The readers who love Flo make all the hard work worth while. In other news, I recently started writing a book that's been itching in my head to get written for a long time. I was hesitant to put pen to paper(or finger to keyboard) as it's not my usual genre. It's a stand alone adult contemporary romance, and it's quite conventional although the male lead is very unconventional. He's not the typical manly man, alpha male that the ladies tend to go for. That's the main reason why I'm uncertain as to whether the story will appeal to female romantic fantasies, and it could very well crash and burn if I put it out there. I know that it appeals to me, but then again, lots of unpopular things tend to appeal to me. The story is set in my home city of Dublin and the working title is Painted Faces, although I might change this later if it doesn't stick. The book had been building up in my head so much that when I first sat down to write it I wrote almost 10,000 words in one day. If you've ever written this much in a day you'll know that your eye balls want to fall out of your head by the end of it. I won't say too much about the story line as it's still in the very early stages of development. If I end up finishing it I might release it either before or after I release the third Tegan book, which is currently part written and I'm looking to have ready for a January 2013 release date. Anyway, that's all for now. 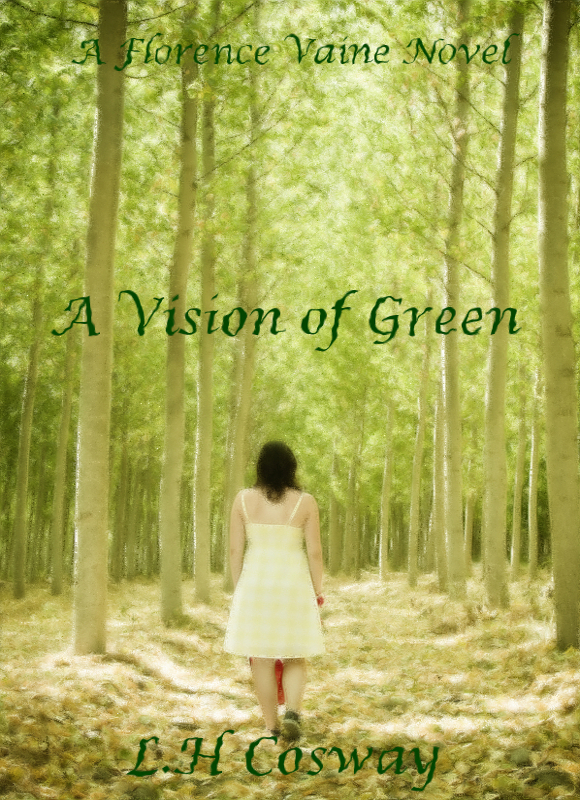 If you're looking forward to reading A Vision of Green you should know that I'm thinking about doing a video blog when it gets released, reading out the first page etc. so you'll get to see my big fat face on camera. Joy.